We’re always working on building the tools marketing and remote teams want and need to visually collaborate and get work done. We’ve made it easier to share and discuss rich dynamic content from YouTube, Vimeo, and SoundCloud directly into your boards! 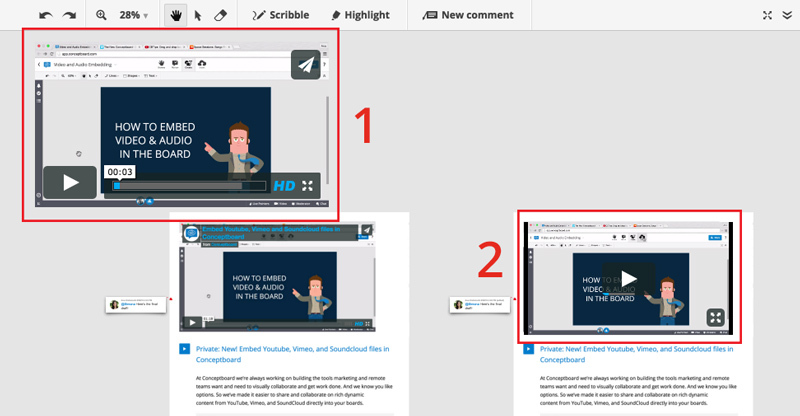 You can embed any public or unlisted video that allows embedding from Youtube or Vimeo. Simply drag and drop the video link from the address bar directly into a board, or insert it by pasting the video’s URL link in the embed dialog, found under the Insert tab in Conceptboard. Playing a video in the board does not automatically play for all the active board participants. This means you can be in one part of the board and watch a video without bothering your colleagues. To play a video, simply hover over the item in the board and then click play. You’ll be able to use the Spacebar to pause and play the video. To use the Spacebar shortcut to move around in the board again, simply click outside of the video or audio item first. To resize or move an embedded item in the board, first switch to the Select tool and then draw a selection rectangle around the entire video or audio item. Resize embedded files so they are easy to view at the same time as other content in the board. For example, video 1 is difficult to view at the same time as the article content. Video 2 matches the size of the article, making it easier to review all items in context. 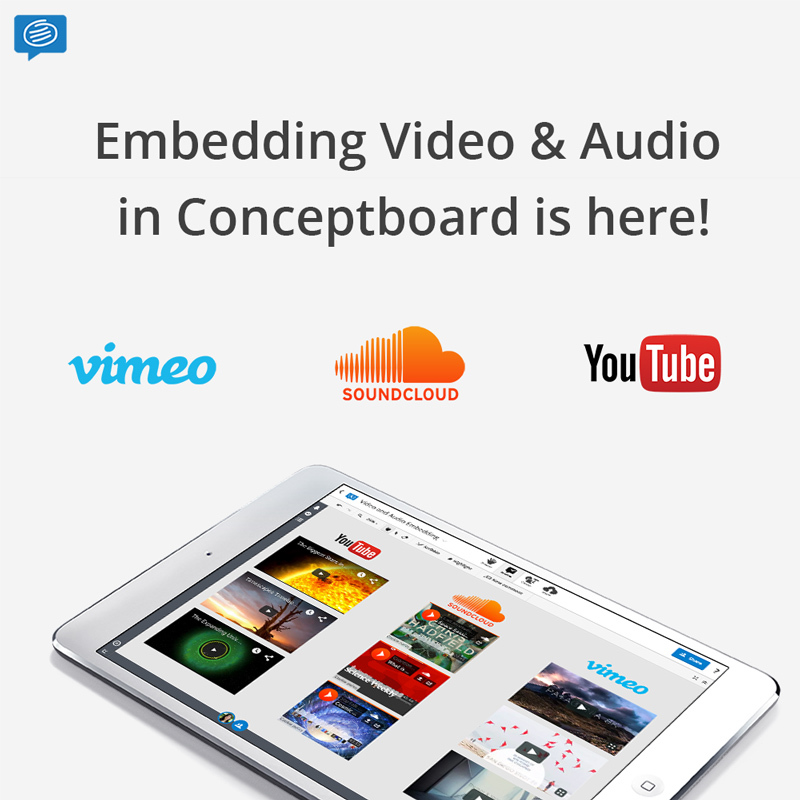 Let us know what you think of the new features in the comments below or tweet to @Conceptboardapp! Wow! I’ve waited for that for so long! Thank you so much! But what about giving an opportunity to play audio/video for all participants? Like google hangouts youtube viewer? It’d be great for teachers like me. Glad you are enjoying the release! At the moment playing the video is not automatic for all board members, but I’ll add your suggestion to our ideas forum, thanks a lot! Any way to timestamp video comments automatically? Not at this time, but I’ll add your suggestion to our idea forum! Cool feature, thanks for adding it! 1. When using the Insert tab + embedd video option, the video is inserted at a seemingly random position at the bottom of the board, couldn’t it be put at the center of the screen? 2. having to draw a rectangle around the whole inserted video to select makes it very difficult to first insert it in a tight layout (even more so when porting former video grab + lin) and to adjust the position or size in a tight layout. An equivalent to the pin icon that is available on pictures to select them would be great. Thanks so much for your feedback, glad you’re enjoying the new feature:) I’ve shared your feedback with the team, and we’ll look into the location of the embedded video as well as making it easier to select a video. You may want to try dragging and dropping a video link into the board, so you can have more control over where it is placed (it’s dropped directly where you place your cursor). This way you can also drop it into an empty area of the board and resize it before placing it in a layout. Hope this helps!